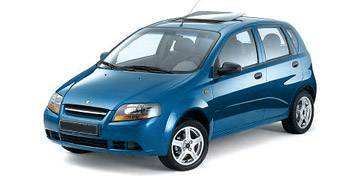 Read our helpful guide to second hand Daewoo Kalos. AA Cars works closely with thousands of UK used car dealers to bring you one of the largest selections of Daewoo Kalos cars on the market. You can also browse Daewoo dealers to find a second hand car close to you today. All used Daewoo Kalos on the AA Cars website come with free 12 months breakdown cover. Now part of Chevrolet's range (re-badged as the Chevrolet Aveo), the Kalos is a five door supermini which manages to be both compact and spacious. Like much of the Daewoo range there is little in the Kalos which isn't entirely necessary, but there is a surprising amount of equipment for such an affordable car. While that might put off some buyers looking for a vehicle which boasts a bit more comfort, this keeps its price down but quality (in the features it does boast) up. The three engines on offer - a basic 1.2 litre option and two 1.4 variants boasting either 83bhp or 92bhp - all favour economy over performance, but have enough zip for city streets and short motorway journeys. Refinement isn't exactly exemplary, but considering that it is a budget car rather than a brilliant one, it performs very well.